Dorothy Perkins has been around since 1919, though it was founded as H P Newman ten years earlier. Now part of the Arcadia group that includes Topshop, Topman, Burton, Evans, Outfit and Wallis, Dorothy Perkins has hundreds of high street and shopping centre stores in Britain, and overseas stores in such far flung locations as Malaysia and Peru. Dorothy Perkins have most of their clothing lines in sizes 6-22, they also sell shoes in sizes 3-9. They also have a ‘petite’ range which is aimed at women under 5′ 3″. How can I check my Dorothy Perkins Gift Card balance? You can call Dorothy Perkins on 0844 848 8021 (calls cost 5p/min PLUS network extras). You can also check your balance in any Dorothy Perkins store. Where can I buy a Dorothy Perkins Gift Card? You can purchase a Dorothy Perkins giftcard at any of their UK stores. 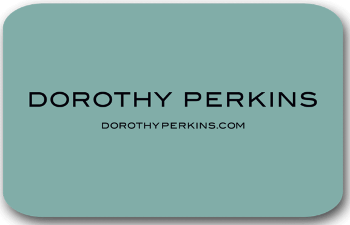 You can purchase a Dorothy Perkins card for you or a friend online from their official gift card store – https://www.voucherexpress.net/dorothyperkins Note, there is a delivery fee of £2 (when we last checked). You can buy an Arcadia group gift card, which can be spent in all Arcadia group stores including Dorothy Perkins from some supermarkets, including Morrisons and Sainsburys. Where else can I spend Dorothy Perkins Gift cards? You can redeem Dorothy Perkins gift cards in any Arcadia group store, including Topshop, Topman, Wallis, Evans, Burton and Outfit. Does a Dorothy Perkins gift card expire? Yes. If your Dorothy Perkins gift card is not used for a period of 2 years it will be cancelled and you will lose any balance on the card. You can only use your Dorothy Perkins gift card in UK stores – it is not valid overseas. Make sure you spend your Dorothy Perkins Gift Card before it expires!